I'll resist the temptation to say they look cute! How old will they be when they are ready to work and do they need any training or is it all instinct? i made friends with honey a week ago ,the deep kill bite (up the sleeve and on im ) was ace as foreplay to a 40 min workout . Thanks Sparky, I take it that the one on It's own is the Hob that you have so kindly promised Carl. For those of you that were here for the weekend in Jan, my mate Carl had that big hob, well sadly he died about three weeks ago. So I asked BunnyKiller if he knew of any and it just so happened that Sparky has so all is well. When will he be ready mate? 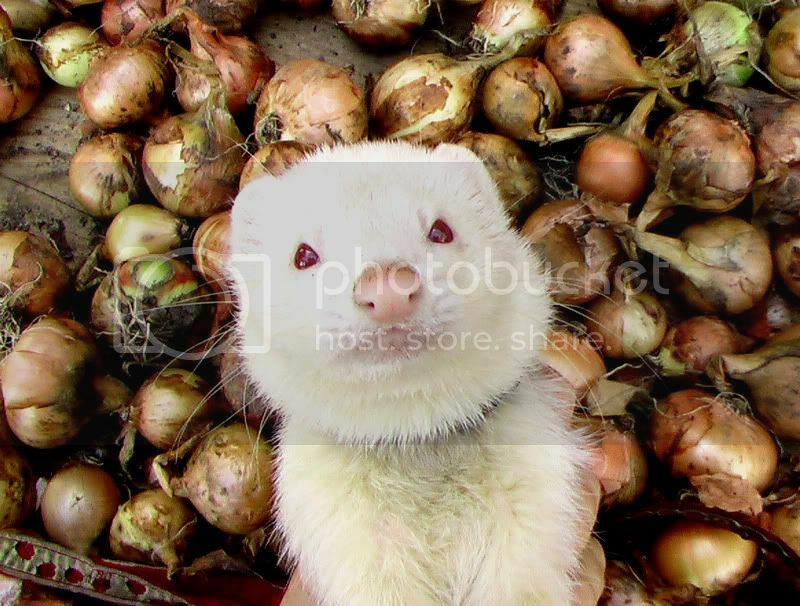 i love ferrets! hehe, although I don't hunt with them coz personally I dont think I could kill a rabbit, and I wouldn't want my babies to have hurt whilst down a hole with a kickin' bunny. On many occassions I am against people hunting with ferrets only because of the way the ferrets are kept, and because it is done as a sport; with no purpose. I think i would go hunting only to give the ferrets the rabbit! 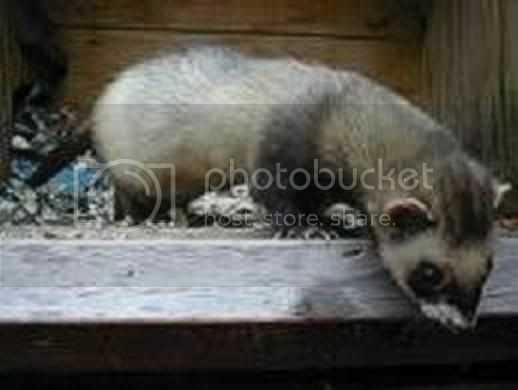 IMO - A ferret is a hunting animal and should be treated as such ie.Well! They are fed whole carcase animals and the 3 I have atm have a hutch and run of 24cu ft or larger.They are handled and played with daily. I hunt them throughout the winter months and occaisionally into the spring if there is a specific problem.The rabbits are used by myself,neighbours,friends,dogs and ferrets. You should give your ferrets a try in a few netted burrows and see how ruthless they are,as nature has provided them with senses and a natural ability that makes us look pathetic. I suppose many animals (as companion animals) are hunting animals, but are not kept as such. I think its great that you handle you ferts daily and give them the meat, if they have a good life then thats fair enough. Sometimes I think i should go hunting, because I can't stand to buy chicken, i hate that; because I can never be assured that the chicken was killed quickly in a humane way. If i were to hunt at least I could guarantee the animal would have a quick death. Its deffinitley one to think about when keeping a meat eating animal. As a vegetarian I don't mind giving the ferts meat, but I do care about where I get it from. Ooh the dilema. I am okay for a bit though because I still ahve some old chickens in the freezer from our chooks, and i knew they had a super life with a quick death. 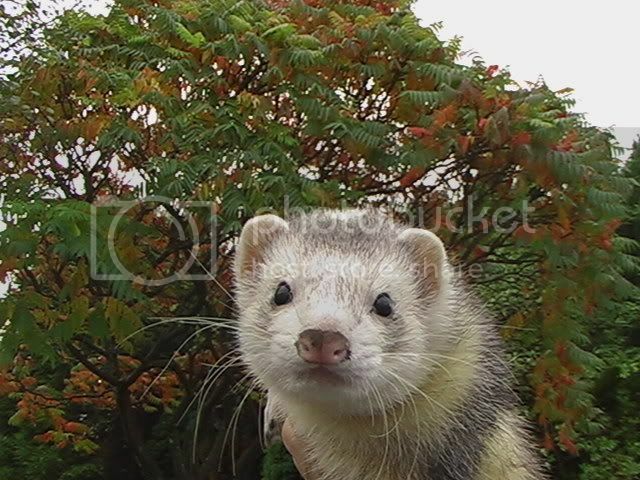 I have some cute ferret kit piccies to share too. These belonged to my baby sister. 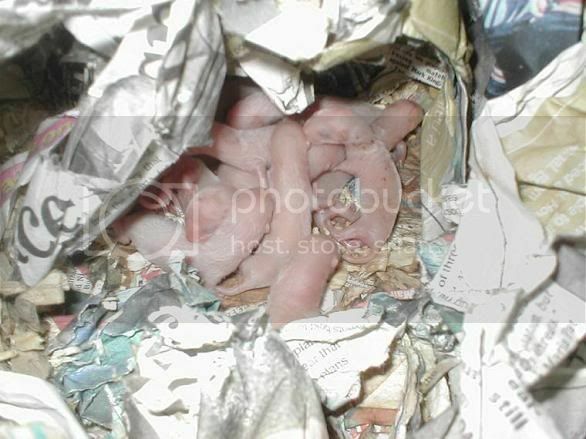 There were 13 kits in this litter. Naomi - Do you have a close up of the dark ferret that is in the background,top right ?? 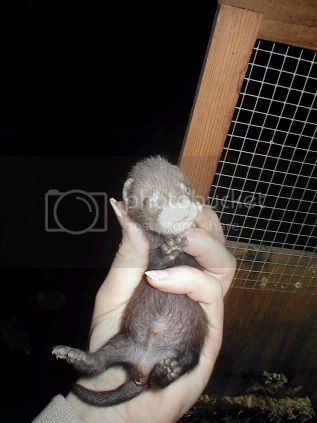 i really like the polecat markings, i used to have a sable and a sandy (or if you're posh: champagne). 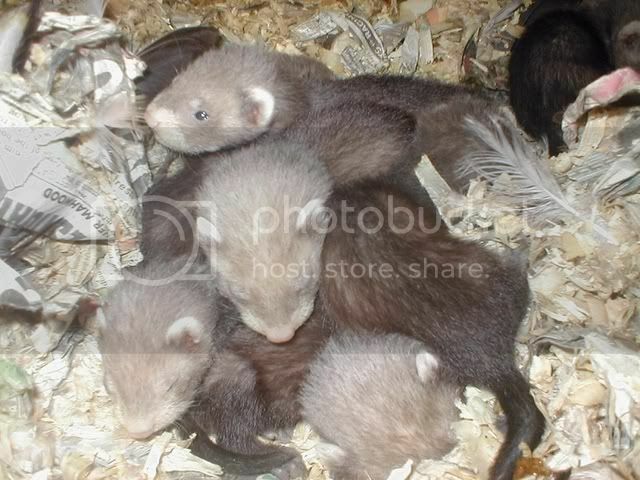 curse ferret-math, how come you can't have just one? 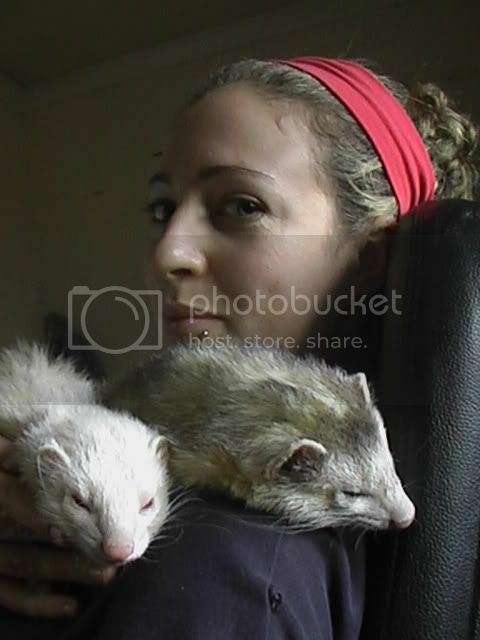 Sorry these are the only other ferret piccies I have on my pc. 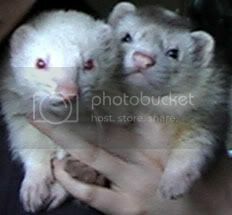 I'm a ferret fan and would love a black one but I don't think they exist. 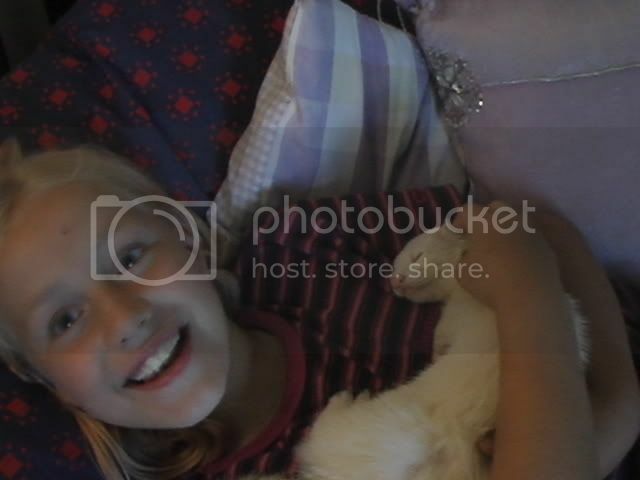 I used to have 4 many years ago.